Today is Reformation Day, a day that marks the beginning of the re-formation of the church through the protest of Martin Luther towards the pardoning practices of the Catholic Church. 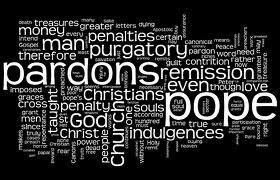 Known as the “95 Theses”, Luther’s disputation of the Catholic Church’s work of selling indulgences was a primary concern to Luther as he noted that the church was propagating the preaching of forgiveness through the purchase of an official pardon from the pope. Written back in 1517, Luther saw how the process of a ‘third-party-broker’ to mediate forgiveness as being anti- scriptural, but a also means of spiritual manipulation and control. For, how can the pope know the extent of total and complete contrition and repentance from a believer? Similarly, the selling of indulgences eradicates the power of the cross and nullifies the effectual work of Christ accomplishing a substitutionary atonement on behalf of all who would put their faith in Christ. Can the Church Today be Like the Early Church? I always here favorable things spoken of the early church. Never mind all the torture and persecutions the early Christians faced. The early church, by all accounts today, seems to be the penultimate church though it was the first. All things considered, why do so many people want to go back to the early church? My question stems from conversations I hear people and pastors engage in on whether or not their church is a 1st century church. Definitely, the more 1st century a Christian church is, the more spiritual the church seems to be. This estimation is somewhat simple but all too pervasive in the discussions I have heard. Essentially, 1st century church is good and 21st century church is bad. First, what does it mean to be a 1st century church? I don’t think anyone quite knows all the answers to that question but the general consensus is that it is a church that follows the Acts 2:42 model of praying together, eating together (or partaking in the Lord’s supper), meeting together in large and small groups, and devotion to the apostles teaching. Since we can’t go back to the 1st century, we must embrace the function of scriptural imperatives but change the form for cultural contextualization. The biggest aspect of what lacks in most churches today in being a ‘true’ new testament Acts-type church is that it does not faithfully proclaim the apostles teaching. Therefore, you can eat meals together,pray, even share in the Lord’s table but still have teaching that is contrary to the Apostles teaching. So what was the apostles teaching? It was the gospel – the good news of Jesus Christ the Messiah. Their message was not man-centered but Christ centered. They did not teach the things of man but of God. In conclusion then, what do people crave when they want to go back to the early church? In my opinion, they desire the freshness of the gospel. God’s message of salvation is the main distinction that separates what is and is not a new testament church. Essentially, today, people can meet together every week in a building but not be changed by the teaching. The apostles teaching was transformational – indicative of action. Any church that does not preach the gospel is not teaching what the apostles taught and therefore, not inducing spirit-led change to those who hear the message.